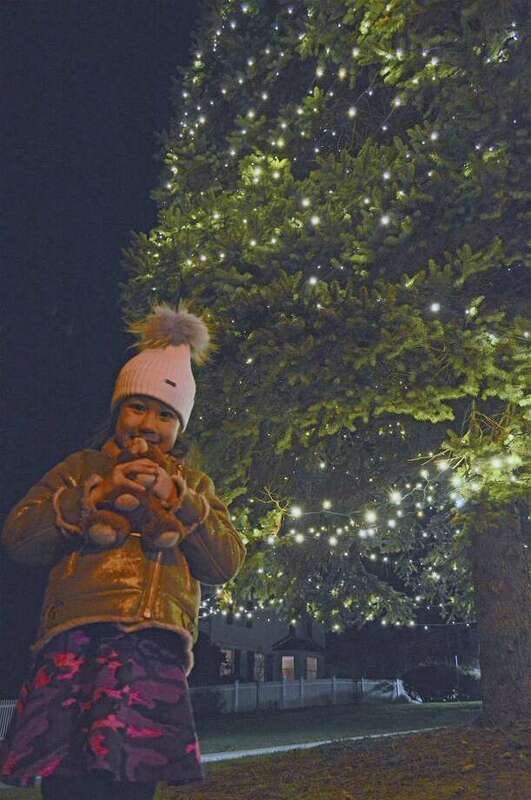 Samantha Fradella, 4, of Westport, poses for pictures at the annual Town Hall tree lighting, Thursday, Nov. 29, 2018, in Westport, Conn.
WESTPORT — With a flash and a flair to the sounds of holiday crooning, the town’s annual tree-lighting ceremony took place Thursday evening outside Town Hall. “Traditions like this Christmas tree lighting are what help maintain and enhance the heritage and character that make Westport so special,” said First Selectman Jim Marpe, who was joined by a bevvy of children when he threw the switch to illuminate the grand fur tree. Along with musical accompaniment from the Staples High School Orphenians, the Westport Historical Society also played host to a post-lighting party across the street, which included a visit from Santa Claus.